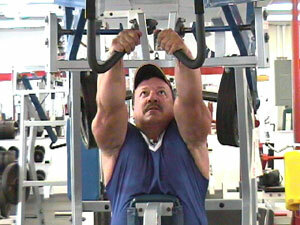 The fourth in the series of ten, this video is packed with pumping action, showing proper pace and sequence in Back and Tricep training also lower back and traps are covered in this informative 52 minute video, Casey and his long time friend RED DRAGON, fly and pump through this action packed video, with lots of important information for the serious gainer. with Twelve Excercises Total for Back & Triceps. THE SINGE (Back & Tricep) is a must see for the serious gainer. This is the fourth of ten videos for your collection, to inspire and enlighten serious gainers.